Here are some nifty facts about credit scores you probably didn't know -- and if you did, you should be working here at Amplify! Your credit score is a calculation that indicates to a lender how likely you are to become 90 days past due on a debt within the next 24 months. Most people think it simply reflects how likely you are to repay a debt, which is true, but the algorithm more heavily considers monthly payment history than number of loans you’ve successfully paid off. Your utility bills, rent, cell phone bills, insurance payments, and income are NOT reported to the credit bureaus. However, if any of your bills end up with a collection agency, they WILL be reported. There are three main credit bureaus that each report three different credit scores. Your scores can vary depending on what information is reported to each of the bureaus. Different lenders report to different bureaus, so don’t just assume a lender is going to decision your loan based on the highest of your three scores. 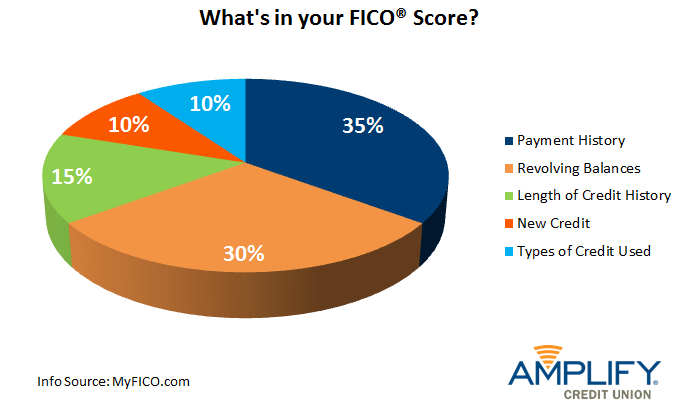 Your FICO® score is actually a blend of the scores from the three bureaus. Some lenders take this score as your credit score, but others may only consider your score from one or more of the bureaus. Amplify and many other Texas lenders use Equifax credit reports to decision loans. As of fall 2014, your FICO® score no longer takes medical collections into account. Medical collections will still show up on your credit report, but they will no longer affect your FICO® score.